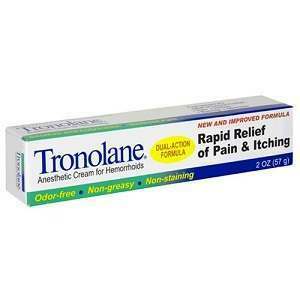 Tronolane is indicated for the treatment of pain, burning sensations and irritation associated with hemorrhoids. As a topical anesthetic, it essentially attempts to block the pain signals as they travel between the affected area and the brain. Tronalane does not have any information published regarding is formula. Tronolane is indicated for dosage as set by a doctor, however the product itself is a non prescription treatment. There was no pricing information found at the time of our research. At the time of our research, there was no guarantee published of any kind. John Parker	reviewed Tronolane	on October 22nd	 and gave it a rating of 2.